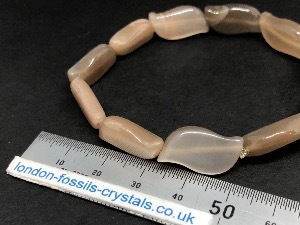 Moonstone - Beige Wave shaped Beads, Elasticated Bracelet. 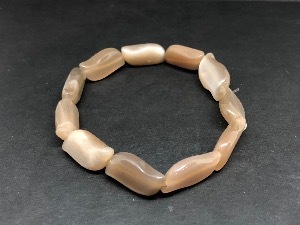 Elasticated bracelet with beige Moonstone wave shaped Beads. Hand crafted bracelet with Stretch Magic Elastic. Moonstone can come in a number varieties, such as White Moonstone, Rainbow Moonstone, Green Moonstone and Black Moonstone. Each with they own properties but all Moonstones are said to have a feminine energy, and considered to help bring a balance to the male-feminine energies. Moonstone is said to calm overreaction to situations, soothes emotional instability and stress, and stabilises the emotions.